When you choose The Kitchen Master to help you revamp your home, you are in good company. Hundreds of satisfied homeowners in the Bartlett 60103 area—as well as other parts of Illinois—have already enjoyed the personalized services that we offer. Whether you want to give your old cabinets a fresh new look by refacing them or completely remodel your home, The Kitchen Master gives you your own project team. Working closely with our creative designers, your project manager and installation team will build the room you always wanted. If you’re ready to get started or simply want more information, give The Kitchen Master a call today at (630) 369-0500 and schedule your free on-site design consultation! Why Choose The Kitchen Master for Bartlett Home Remodeling? The Kitchen Master has sought out the best and brightest creative talents and brought them on board as part of our staff. We strive to employ only those craftsmen who take extreme pride in their work by providing attention to detail while ensuring a high-quality finished design that is completed on time and within the agreed-upon budget. We fully believe that we are only as good as our team. Are you tired of cooking in a subpar kitchen? Do you need more room for your children to sit and do homework while you prepare meals or to entertain guests at dinner parties? No matter what your goals are for your Bartlett kitchen remodel, our team can help. We’ll map out the ideal design and then help you select the best appliances, fixtures, hardware, and finishes to match your preferred style. There are few things more frustrating than a bathroom that is too small, lacks storage, or is generally outdated and drab. You want your bathroom to feel like a retreat, not a trip back to the 70s. Whether traditional or modern is more your style, the expert design-build staff at The Kitchen Master can accommodate your every need. 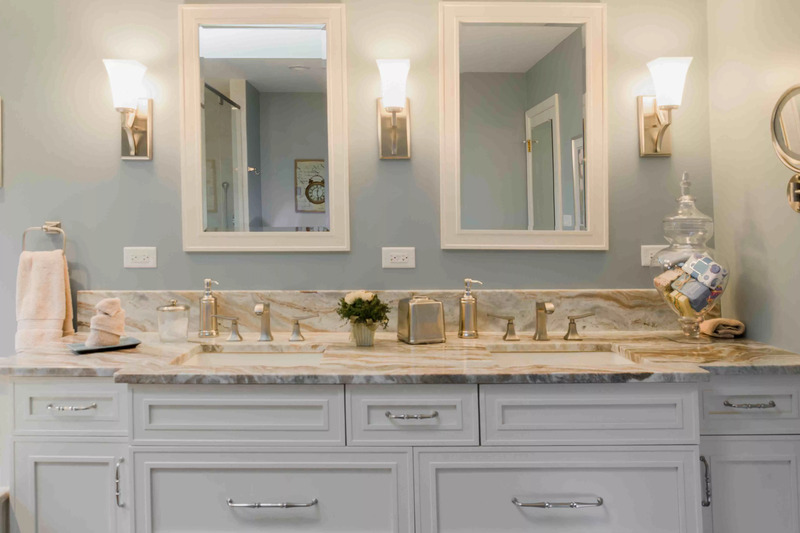 From under-sink storage to rainfall showers and marble countertops—we’ll make sure you have the design you want delivered on time and on within your budget. When you contact The Kitchen Master for a free consultation, you have access to our decades of experience in making homes in the 60103 area look better while increasing their value and the joy that homeowners find within them. We know that you already have lots of great ideas that you want to see implemented within your home so that it can serve you better. Our beautiful 4,000-square-foot showroom in Naperville is the perfect place to look over our work in person. While you are visiting us, you will have the opportunity to meet with members of our design team and view the latest in remodeling materials and trends. You can also take a virtual tour of our designs using our online gallery. If you want more information about the transformation The Kitchen Master can perform on your Bartlett home, we encourage you to contact us today to schedule a free consultation! We provide home remodeling services to Bartlett, IL and the nearby west Chicago suburbs, including Schaumburg, Bloomingdale, Itasca, and more.